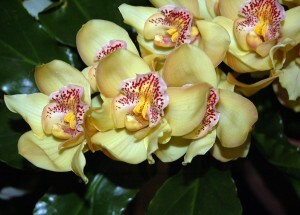 thanks for the information on how to bloom my orchids..it may help me a lot. Hi Mary Ann, it’s enligtening to receive your articles again. I stronger agree with you that it’s neccessary to repot orchid that has been in the same pot for two years or more.Decomposition of the medium has taken place in the pot. Rotting may take place from inside the pot upward. When this condition persists, the possibility of losing the plant is very high.It’s sad to lose a priced cultivar. My brother who lives in New York has several orchids indoor. When I visited him last week, one of his oncidiums appear to be okay, but it has curled leaves and curled drying backbulbs. It has been with him for a long time and has not rebloomed since he bought it. I repotted the plant and discovered that the medium used was sphagnum moss all throughout. The roots are soggy and soft, near rotting. I changed the medium to orchid potting mix (commercial) and removed the sphagnum moss. In the Philippines where I grow orhids, I use sphagnum moss, the same as that in his oncidium, only for decoration on dish gardens, or ground cover for plants on containers. There are many kinds of orchhids medium which are available in our place, but I have never came across orchids planted with sphagnum moss as mediun before. My question is: Is that sphagnum moss the same as the peat moss you mentioned in your article? Your articles are very informative and I really enjoy reading them. I will soon reside here in Virginia and I am really quite sad that I may not be able to enjoy an orchid garden like that one I have in the Philippines, where I grow cattleyas on trees, mostly palm trees; and vandas on drift woods. Morever, I have yet to learn how to grow orchids here in America. I use potting mix that does not degrade to the orchids stay in the same pot for years giving them a chance to grow into large beautiful specimen plants. I have found that some of the ones that I repot take at least one year to get over the shock and start putting out new growth and bloom. Please keep an eye open for my latest article. I love seeing your comments! I use prime agra – its semi hydroponic medium and have almost all my orchids in it as it does not degrade. The prime agra is much more than normal potting medium but i mix in some perlite chunks and charcoal and my orchids are all growing out of their pots and headed to specimen plants. They all have recovered after some had terrible ordeals being in sphagnum moss which either dried out too fast, or stayed far too moist. After repotting all my orchids are growing like weeds- I chopped a few up into small pieces as the bases were rotting from being in spahnum moss- which is peat moss but usually has organic components and perlite mixed in. I repotted almost everything in prime agra and grow in a 75 gallon aquarium under glow panels which are led lights with the right combination of red and blue light but are also next to the southern windows which let in direct sun almost 8 months a year and they all adapt to direct sun when they get it and are all very strong and healthy. The plants bloom on almost all regular basis unless they can bloom more than once a year like my phals which have rebloomed on the same stems or spikes about 3-4 times now. Everything else has bloomed at least once and is well on the way to another later this season or early next year. Thanks I’am really learning very day and your website is very helpful. Just finished your book and joined this blog!! Thank you for your willingness to share your wisdom of growing orchids. I am only 6wks into growing this variety. One flower was at the verytip of a stalk. Second stalk has five flowers. How do I care for the stem that now tall without any flowers? Thanks so much! Thanks for your comment. 🙂 We are happy to have you. Do you cut off all of the stems that are not blooming? If so, when? I have a lot of orchid cactus plants and during the summer in NJ they are hung in my cherry tree (after it has been sprayed with diluted dormant oil). I just got two new orchid plants and wonder if I can put them outside also in the summer months? One is labeled (Blc Delta King x Yellow imp) x Blc Daffodil ‘Green Valley,, the other one is the type that grows on tree bark, but mine is potted. Any help would be appreciated. Thanks for all your information. There isn’t a reason to do that unless the stems look like they are dying. Needed this information badly and will be coming back for more! I am not sure what kind of Orchid I have and I am trying to find out if I need to cut the stalks back after blocking or not. How do I find this out? Sorry, there was a typo. It should have said “bloomimng” not blocking. my orchid has bloomed and now 6or 7 stalks are coming out of the plant, do I leave it alone or do I trim some of the stalks? don’t know what kind of orchid it is- was a gift. leaves are dark green so it needs more light, otherwise it looks very healthy. i give it 2 icecubes a week.